We, Spray Technics, began our operations in the year 1996, as a Manufacturer and Exporter of a diverse and commendable range of SS Wall Cabinet, Paint Booth, Drying Oven and much more. Owing to this, the product is known to have an impeccable sturdiness, service life and dimensional accuracy. Our highly modernistic state-of-the-art infrastructural facility is inclusive of all the necessary machinery, equipment and instruments which facilitates the attainment of a number of the firm’s goals and objectives. For reasons of managing the firm’s operations in the best possible manner, we have parted our facility into several units, under the direct supervision of skilled and experienced managers. Defence Land System India P. Ltd.
Manufacturing, Trading, Importer and Exporter of Sheet Metal Components, Spray Painting Booth, etc. 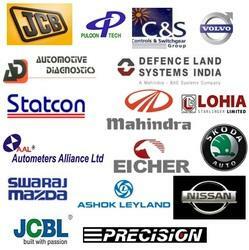 We are well-established and well-known for our supreme quality product range. For better production process, we have recruited some of the best quality controllers who test each and every product at each and every stage of production. Moreover, the procured raw material is also subjected to various stringent tests on several quality parameters to ensure the consistent level of quality of the finished products. The quality control process starts from the very first stage of the procurement of raw material and continues till the final dispatch of the consignment in order to deliver the perfect range at client’s end. Owing to our dedicated and sincere efforts to satisfy our clients, we have established ourselves strongly in the market. We have a highly skilled and experienced team of professionals who enable us to design our wide range of products in compliance with client specifications. We have huge and spacious state-of-the-art infrastructure that is well-equipped with latest machines and equipment. We have segregated our infrastructure facility into various sub-divisions such as R & D, quality testing unit, sales & marketing unit and spacious warehousing unit that help us in carrying out smooth and timely operational activities. The machines used in production are checked at regular intervals by our technician in order to ensure high production rate. Owing to our well-established infrastructure, we are able to undertake bulk orders within the committed period of time. We are instrumental in manufacturing a comprehensive assortment of SS Wall Cabinet, Paint Booth, Drying Oven and much more.